Truly inspired by Starburst, one of the NetEnt’s most popular and rewarding games ever, Berryburst is a 5-reel 3-row 10-payline classic slot machine set in a modern environment featuring the eye-catching graphics and nice sound effects. The game offers Wilds on Reels, Expanding Wilds, Multipliers and Free Spins leading to the jackpot of 3000x your stake, while the Berryburst slot review will show you how to win them. A screenshot is worth a thousand words, right? Here you go! 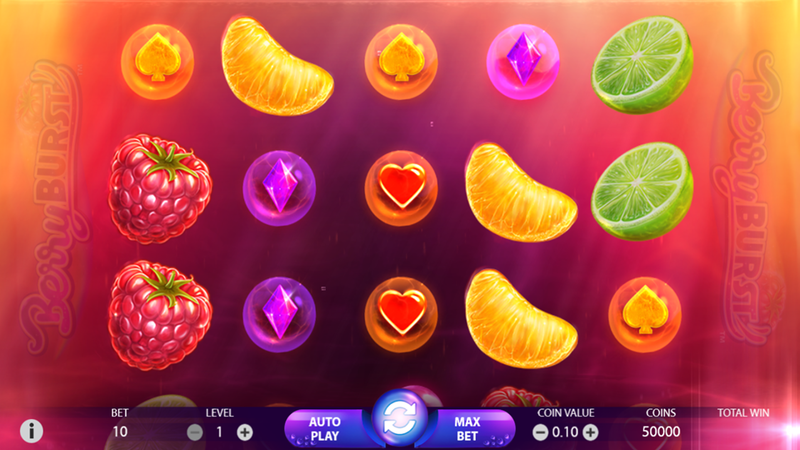 But in the end, you have to try Berryburst yourself – one of the recommended casino sites should fit perfectly! Thanks to the Cluster Pays mechanics, forming a winning combination should not pose a problem to anyone who lines up 5+ symbols of the same kind. Whether you play for fun or for the real money, the Autoplay option can be used to set a number of spins you’d like to have without being interrupted. The coin value between €0.01 and €2 allows you to wager with €0.10 up to €200 per round. As the game has 1-10 levels, it is possible for every player to stick to his own betting strategy. The W-shaped icon is the Wild and once appears it will become an Expanding Wild and cover the entire reel in the explosion of colors and sounds. This is also a way to land a big win, according to the paytable. Tips: the screen full of Wilds grants the big win of 5.000 coins. During the Berryburst bonus round activated with Wilds and Expanding Wilds, the winners will get up to 5 Berryburst free spins. Moreover, all winnings scored in this round are a subject to the multiplier of 2x. The game doesn’t require a player to download the Android .apk file or the iPhone app in order to play online as it was built in the HTML5 mobile-friendly technology. Demo mode is enabled by default. 3. What is the RTP factor of Berryburst? The info from the official sources states the RTP is 96.56%. As the Berryburst recension showed, we have a potentially huge hit and it won’t be a surprise to see it as a standard part of bonus packages at the NetEnt-powered sites. Still, you must bear in mind that the edge favors the house, so arm with the patience before starting the Berryburst free play mode or play for cash.